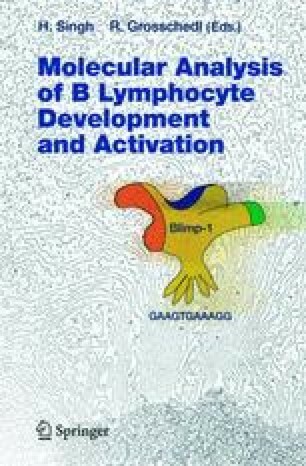 The developmental program that commits a hematopoietic stem cell to the B lymphocyte lineage employs transcriptional regulators to enable the assembly of an antigen receptor complex with a useful specificity and with signalling competence. Once a naive IgM+ B cell is generated, it must correctly integrate signals from the antigen receptor with those from cytokine receptors and co-receptors delivering T cell help. The B cell responds through the regulated expression of genes that implement specific cell expansion and differentiation, secretion of high levels of high-affinity antibody, and generation of long-term memory. The transcriptional regulators highlighted in this chapter are those for which genetic evidence of function in IgM+ B cells in vivo has been provided, often in the form of mutant mice generated by conventional or conditional gene targeting. A critical developmental step is the maturation of bone marrow emigrant “transitional” B cells into the mature, long-lived cells of the periphery, and a number of the transcription factors discussed here impact on this process, yielding B cells with poor mitogenic responses in vitro. For mature B cells, it is clear that not only the nature, but the duration and amplitude of an activating signal are major determinants of the transcription factor activities enlisted, and so the ultimate outcome. The current challenge is the identification of the target genes that are activated to implement the correct response, so that we may more precisely and safely manipulate B cell behavior to predictably and positively influence humoral immune responses.